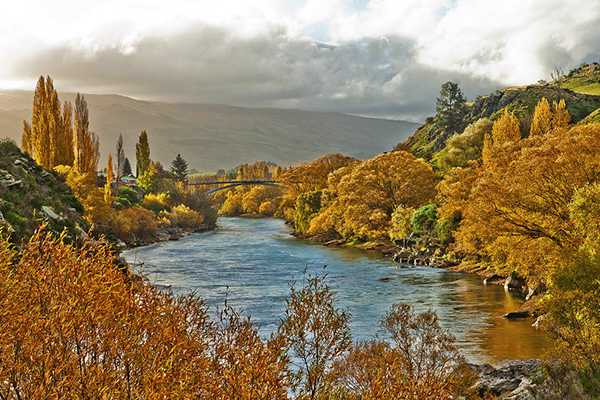 Below, the view of the Clutha River with the bridge in to Alexandra in the background. Above, Justin riding through the fall trees. Photo by Casey Hatfield-Chiotti. Here’s what I knew for certain about today’s ride: There were going to be some serious climbs up a very narrow trail built in to the cliffs of the Roxburgh Gorge and that I was, without doubt, the weakest rider in our group. The last thing I wanted was for everyone to get back to the meeting point in Alexandra and then have to sit around for half an hour or longer waiting for me to show up. So I figured I needed to come up with a riding strategy. Which was this: Go like hell early and for as long as I could, hoping I could get a big enough lead on the rest of the pack that they wouldn’t catch me until about half way through the ride, thus cutting down on the wait time at the end of the trail. So bam, I flew. Which in a way was kind of pathetic because the scenery riding along the Clutha River, particularly when you did a thousand feet of switch-backs to get to the top, was spectacular. Normally I’d be stopping every ten minutes to take some photos (and I assumed, rightly, that the rest of the pack behind me would be doing the same), but today I just kept moving at as quick of a pace as I could. As Nev said, it was kind of a hairy trail. There were spots when I had to get off my bike and walk it over a sheer-drop trail, no more than two feet wide, while hugging the rock wall. But every time I summited, I’d look back down at the switch-backs, expecting to see the pack advancing on me, but they were nowhere in sight. In fact, the only rider to eventually catch me was Nev, who was in a hurry for his own reasons: he had a slow leak in his back tire and was trying to race ahead before it gave out on him. He almost made it. The tire finally went completely flat just as we were both approaching the Alexandra bridge. “I’ll walk it in,” he said. “Why don’t you go ahead. We’ll see you back at the van.” So I did the final mile or so of the trail back to Alexandra and then sat on the edge of the river watching as the others slowly cycled over the bridge. 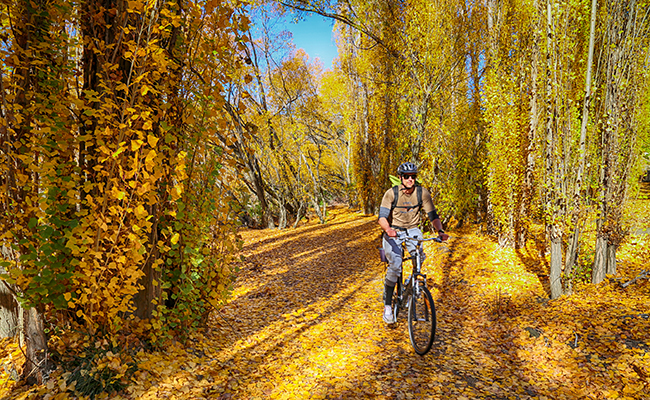 Our ride over the Central Otago Rail Trail was over. But what an experience. Wow. That landscape is like a painting, not a photograph. Stunning colours. And as a cyclist, I think cycling up hills is over-rated. There’s only so much lungs and thighs can take.